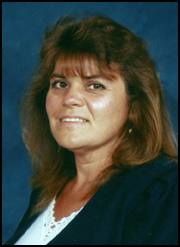 It’s been a while since my good friend, Debbie Peterson, has visited my blog. I am so excited to have her back today with a new release. If you’re not familiar with Debbie, she writes sweet paranormal romances with a fabulous helping of history in each. While writing, whenever I needed to recapture the hallowed, reverent feelings D-Day inspires, I would watch the YouTube video called “The Boy on Normandy Beach.” It gets to me – Every. Single. Time. Unchained Melody as recorded by Inka Gold became Katie and William’s song without any forethought whatsoever. I wasn’t even searching. The thing just started playing in my head while I was writing. Two days before the release of Love Letters from Heaven, I learned it was also going to be released in Audio book format! If you’re a fan of audio books as well as paranormal romance, you might want to watch for its upcoming release. I’ve got a special Pen Pal on my blog today–Debbie Peterson, whose novels I love. I’ve read them all, and each time I think she can’t out do herself, she does. 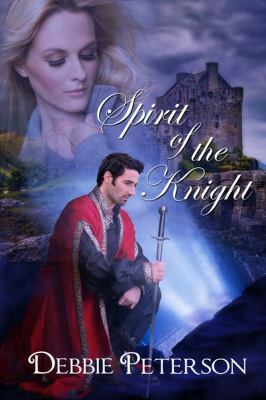 I’m currently deeply engrossed in her latest release, SPIRIT OF THE KNIGHT, and think it’s my favorite to date. A Scottish Castle, romance, ghosts, mystery . . . what’s not to love? Mariah Jennings, the heroine of “Spirit of the Knight,” believes in ghosts. 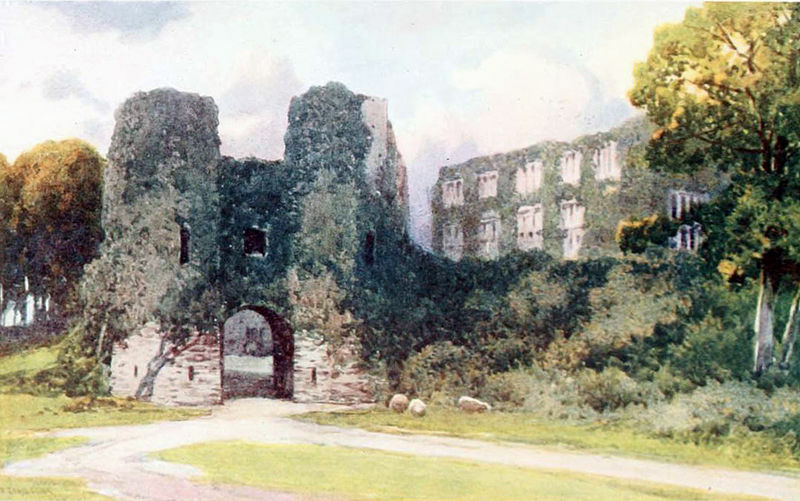 After all, she has seen her fair share of them since taking on the task of painting castles for “The Gallery of Castles Project.” For instance, shortly after arriving at her first assignment in South Devon, England, she discovered firsthand the wild tales concerning Berry Pomeroy Castle were, in fact, quite true. The mysterious castle ruins, nestled deep in a wooded valley, charmed Mariah at first glance. She easily imagined William the Conqueror gifting the lands to Ralph de Pomeroy in appreciation of his support during the Norman invasion and all the way through the battle of Hastings in the year 1066. Yet, the lovely fortification wouldn’t grace the area until 1305. Her research also revealed that two centuries later, Sir Edward Seymour, brother-in-law of King Henry VIII and Lord Protector of England, acquired Berry Pomeroy in the 1540’s. During his tenure as Lord Protector, Sir Edward made a host of enemies. Therefore, it didn’t surprise a soul that in October of 1549, the Earl of Warwick managed to oust and imprison him in the Tower of London. His subsequent conviction on twenty-nine different charges resulted in a death sentence. Edward’s enemies saw him executed on the 22nd day of January, in the year 1552. 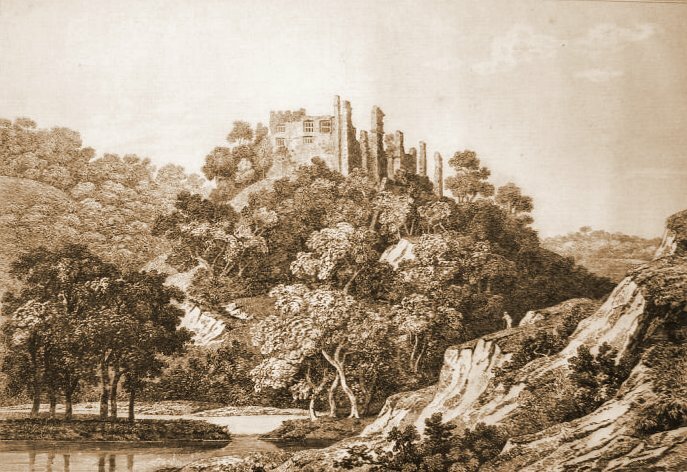 His death notwithstanding, the Seymour family inhabited the castle until 1668 and retains guardianship to this very day. Now, the day Mariah arrived at Pomeroy, the locals regaled her with stories of ghostly apparitions and strange phenomena. They spoke of lights without source, disembodied voices, cold spots, and sudden, freak winds. She could testify to all of that and within the first few days of her stay. Those particular events didn’t pose a problem for Mariah. However, becoming a witness to the legendary, full-bodied apparitions took far more courage. While inspecting the shadowy dungeon, she came face to face with the “White Lady.” This particular ghost haunts the castle prison, and rises up from the tower known as St. Margaret’s, to the castle ramparts. She is the spirit of Margaret Pomeroy, imprisoned by her sister Eleanor, after Lord Pomeroy left for the crusades. Unfortunately, their father left Eleanor in charge. According to legend, jealousy of Margaret’s beauty and her love for the man she too desired, Eleanor slowly starved Margaret to death, following a two-decade incarceration. During her stay, Mariah oftentimes heard unexplained screams accompanied by heavy thuds in a vicinity of the castle known as Pomeroy’s Leap. This, the locals said, was easily explained. Besieged at the castle, with defeat imminent, two brothers dressed themselves in full armor. They mounted their horses, rode off the top of the castle ramparts, and fell into the precipice below. An act–considered heroic by some–they apparently replicate to this very day. Despite the beauty of the castle, Mariah seemed quite relieved the day she packed her belongings and headed to the next castle on her list. I can’t say that I blame her though, do you? Thanks Mae, I truly enjoy each of my visits with you! Renowned artist, Mariah Jennings hired to paint a thirteenth-century Scottish castle, gets the shock of her life when she encounters the handsome knight who has dominated a lifetime of portraits and sketchbooks. 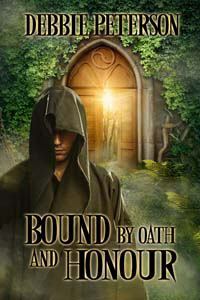 But Sir Cailen Braithnoch is no ordinary ghost, nor did he suffer an ordinary death. Magic of the blackest kind cast a pall over the knights centuries ago. As the ghost and his lady seek to unravel the paradox surrounding his death, black arts, otherworldly forces, and a jealous rival conspire against them. ABOUT THE AUTHOR Debbie has always had a soft spot for fairy tales, the joy of falling in love, and happily ever after endings. Stories of love and make believe filled her head for as long as she can remember. However, it was her beloved husband who encouraged, cajoled and inspired her to take up a pen and write some of them down. Her journey to published author could fill quite a few pages, but in June of 2010, she submitted her debut novel, “Spirit of the Rebellion” to her wonderful, patient, editor at The Wild Rose Press. 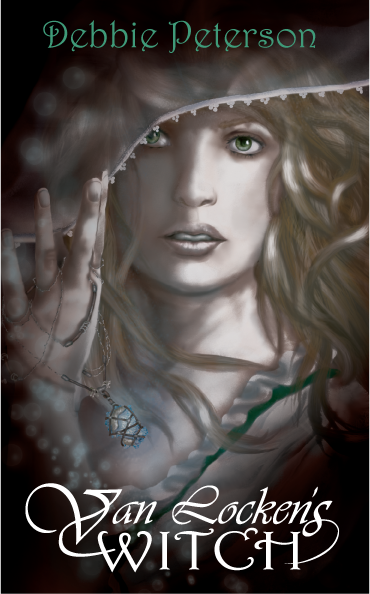 A few short months after Rebellion’s release, her second novel, “Shadow of the Witte Wieven” was published through InkSpell Publishing. 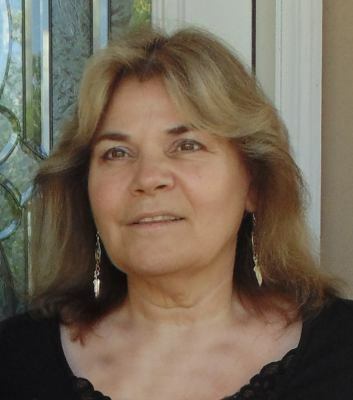 Her third novel, “Spirit of the Revolution” was released in 2013, through The Wild Rose Press. Today, I’m delighted to share the absolutely gorgeous cover of my friend Debbie Peterson’s paranormal romance, VAN LOCKEN’S WITCH. It’s just stunning! As always, Debbie weaves the supernatural with romance and history, a combination I love. I’m so looking forward to reading this and have already snatched up my copy from Amazon! Debbie has always had a soft spot for fairy tales, the joy of falling in love, and happily ever after endings. Stories of love and make believe filled her head for as long as she can remember. However, it was her beloved husband who encouraged, cajoled and inspired her to take up a pen and write some of them down. 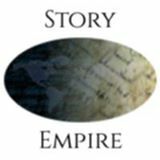 Her journey to published author could fill quite a few pages, but in June of 2010, she submitted her debut novel, “Spirit of the Rebellion” to her wonderful, patient, editor at The Wild Rose Press. 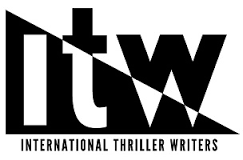 A few short months after Rebellion’s release, her second novel, “Shadow of the Witte Wieven” was published through InkSpell Publishing. Her third novel, “Spirit of the Revolution” was released in 2013, through The Wild Rose Press. Today, I have an extra reason for feeling upbeat. 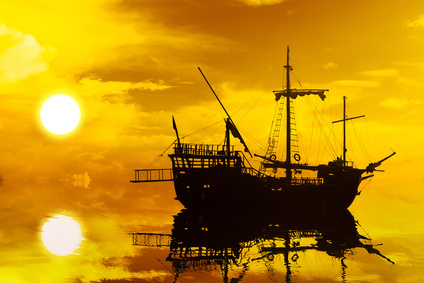 My good friend, Debbie Peterson, has invited me to her blog to discuss my “attraction to the sea.” Please drop by if you get a chance to share your own comments about what attracts you to the ocean and its enchanting folklore. You can find the post here. It’s Tuesday and it’s June. These are definite facts. 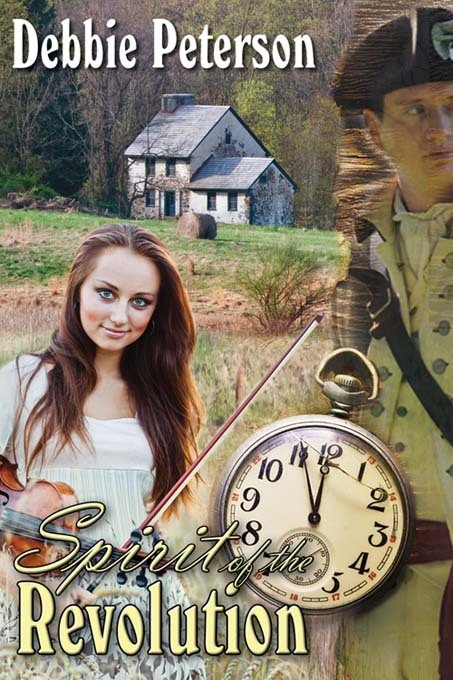 It’s also a fact you’ve seen SPIRIT OF THE REVOLUTION on my blog before, but my friend Debbie Peterson is now enjoying the “official release” of her paranormal romance and I couldn’t let that pass without a tip of the hat for story well told. Because I’ve shared about the book before, I thought I’d share a bit about Debbie today (although you know the book is ultimately going to make an appearance, right?). I hooked up with Debbie after reading her earlier release, SPIRIT OF THE REBELLION. That book featured the ghost of a Civil War captain falling in love with a modern day woman. Hello?!?! Civil War hero? Seriously, need I say more? I was smitten. With the characters, the story, with Debbie. 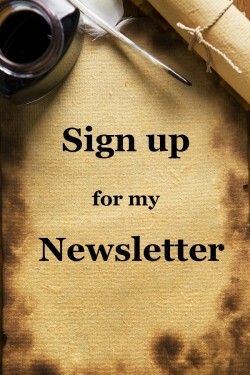 After getting wrapped up in the star-crossed romance of Tristan Jordhal and Shae Lynn Montgomery, I shot her an email, told her how much I liked her book and invited her to appear on my blog. We’ve pretty much shadowed each other online since then, being supportive of each other’s releases. Which brings me back to SPIRIT OF THE REVOLULTION. Debbie is currently doing an excerpt tour with a giveaway. You can find all the details and her latest round of tour stops on her blog — Debbie Peterson, Author of Paranormal Romance. And while we’re speaking of Debbie’s blog, I hope you’ll pop over and give it a good look-see. Debbie researches and shares some of the most goose-bump inspiring paranormal stories I’ve encountered. 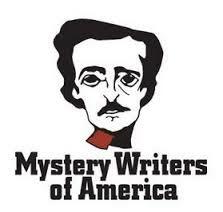 Haunted battlefields, wandering ghosts, spooky mansions, mythical ships – she’s always digging up some obscure eye-witness account of the strange and the bizarre. Debbie Peterson has a gift for telling a tale of impossible romance. Part of the delight in her books is sharing the journey and wondering how she’s going to bring about an ending that leaves the reader with a contented sigh. If you’ve read her previous book, SPIRIT OF THE REBELLION, you know she enjoys pairing a hero from the past with a heroine in the present. In the case of SPIRIT OF THE REVOLUTION, we get Mathias McGregor, leader of a band of Pennsylvania Rangers/spies who support the Patriot cause and are called upon to deliver intelligence to George Washington. Unfortunately, before they can fulfill their assignment, they meet an untimely end at the hands of the Redcoats. Fast forward to the twenty-first century where Jolena Michaelsson, a renowned violinist, has bought the house where Mathias and his rangers linger in ghostly form. It isn’t’ long before Mathias and `the boys’ introduce themselves. What follows is a mix of romance, mystery, genealogy, history and adventure. Like Jolena, I fell in love with the boys immediately, especially Mathias and his closest friend, Sam. There’s a particular scene near the end that had me reaching for Kleenex and pleading right along with Jolena. It was late, but I couldn’t put the book down until I finished it and reached that impossible how-did-she-pull-it-off satisfying ending. I highly recommend SPIRIT OF THE REVOLUTION for anyone who enjoys an engaging read offering a unique blend of romance and history with characters who will steal your heart! 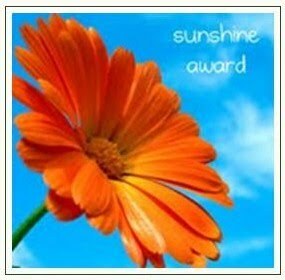 It’s a sunny day when my friend, Calisa Rhose, nominates me for the Sunshine Award! 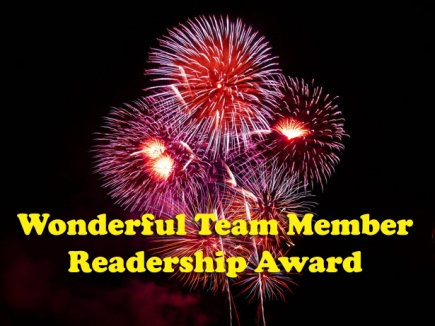 This is a fun award that bloggers give to other bloggers “who positively and creatively inspire others in the blogosphere.” What a great thought, and how lovely to be included among the ranks. Thank you, Calisa, for thinking of me! If you haven’t moseyed over to Calisa’s ranch, you’ll find it filled with sunshine and friendly chatter! Calisa is one of my sister authors at Lyrical Press and a wonderful writer. The welcome mat is always out at her ranch. She loves visitors, so be sure to drop by. You’ll see for yourself why she earned a Sunshine Award. Pass the award to 10-12 deserving and inspiring bloggers, inform them and link to their blogs. Favorite color: This is always a toss-up between green and blue, the colors of earth, sea and sky. At the moment, I’m partial to blues and have to go with royal blue. Favorite animal: Cat! I adore felines. Favorite non-alcoholic drink: Coffee in the morning, water any other time of day. I constantly have a glass of iced water beside me. Facebook or Twitter: Twitter. Facebook and I do not play nicely together. I’ve been planning a blog post on that for a while, LOL. Your passion: My hubby, of course! 🙂 Assuming, we’re not talking about that kind of passion then writing, reading and learning in general.. Giving or getting presents: Both. I’ve pulled off some pretty cool surprises in the giving department, like the time I surprised my husband with a John Deere tractor for his birthday. Favorite flower: Roses, the flower of romance. Red is my favorite but I love them all—white, pink, yellow, blush orange and all varieties of colors. Thanks for bringing a bit of sunshine with your blogs, ladies!